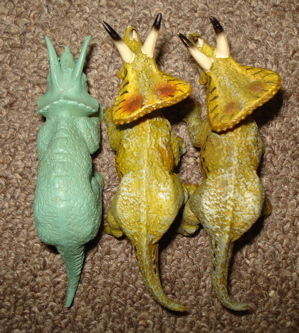 The Torosaurus Dinosaur toys are but may not be. 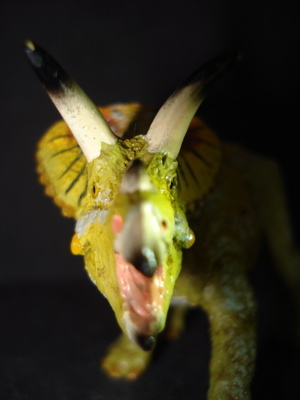 The Torosaurus Dinosaur Toys: No Bull! It is common to think of a "bull" when we see the word "Toro" but, in this case, you would be wrong. The name of this magnificent creature means "perforated lizard" (opens new window) based on the large holes, covered by scales, in the massive frill protecting the neck and the back of the head. The frill itself would likely be too heavy to carry if it were not for these holes. 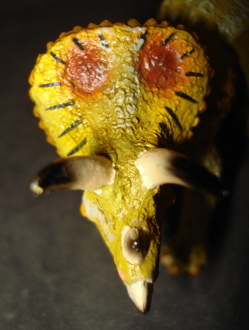 The very similar Triceratops also had smaller holes in its frill and some paleontologists believe that the creature we have come to know as the Triceratops is in fact a sub-adult (not fully matured) Torosaurus. I certainly don't know. I report, you decide. 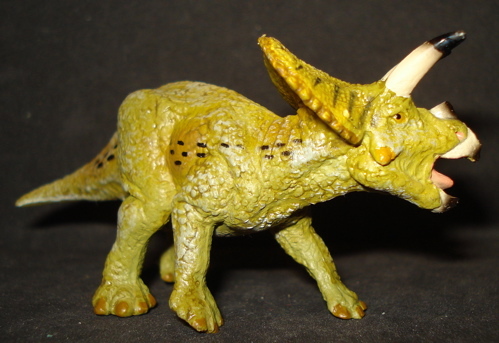 What I do know is that, for whatever reason, the Torosaurus is the same approximate size as the Triceratops and makes a terrific addition to my Dinosaur toys collection. 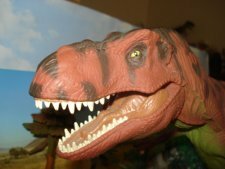 In 2004 Safari Ltd. combined with The Field Museum to produce Dinosaur toys based on their infamous Tyrannosaurus Rex fossil, "Sue". Along with (two) "Sue" a pair of vegetarian Dinosaur toys were also created, an excellent Anatotitan and this wonderful little Torosaurus. 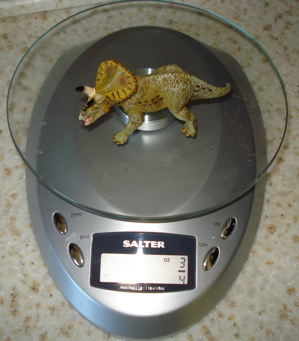 Weighing in at three-quarters of an ounce (.75 oz, 20 gms) and measuring four inches (4", 10.2 cms) in length, based on the twenty-five foot long and 4-6 ton original it comes in at about 1/75 scale. 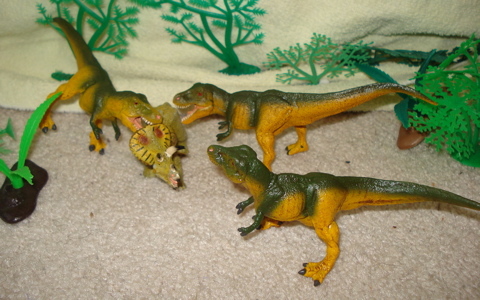 Its actual size, in fact, allows it to fit right in with the vintage Marx and MPC Dinosaur toys from the 1950s and '60s. Let's take a closer look at this wonderful figure. 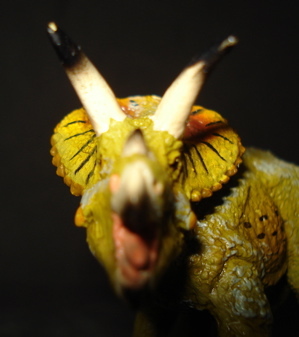 The detailing on these comparatively small Torosaurs is really exceptional. 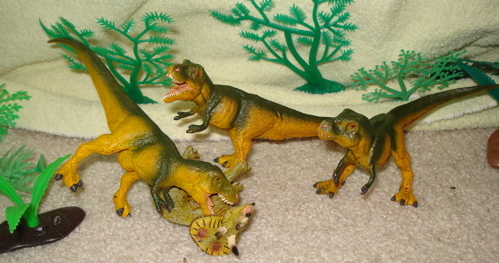 I tend to think of Dinosaur toys as being life-like, rather than "realistic", since no one knows what they really looked like. Detail is important and these are quite well detailed.... And life-like. "I challenge you for rule of the herd!" They come in a dynamic stance with their head turned to the left at about a fifteen degree angle. The legs are long and well muscled, balanced with the rear legs set and the front feet up on the toes, prepared for action. The beak is open and the eyes are focused forward. These are handpainted and very, very well done. 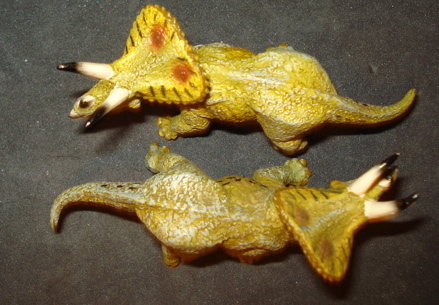 They became among my favorite Ceratopsians Dinosaur toys as soon as I got hold of them. The coloring itself is a basic light-olive green material with pale-blue highlighting and black spots. The frill is colorfully done with dark-yellow sides, brown edging and vertical black stripes. 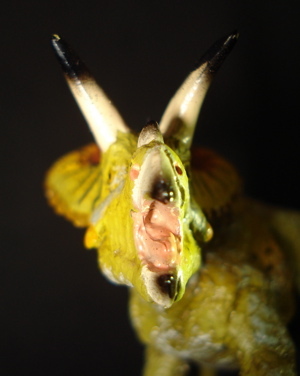 The horns and beak are pale beige with black tips and a pink mouth and tongue. The frill (left) looks terrific and is textured so as to appear to be scaled while the edge is scalloped. The red spots on the frill would be contiguous with the two largest 'perforations' in the underlying bone. Looking at this guy head-on (below) we can get a sense of the dynamic energy that Safari Ltd. has imbued their little Torosaurus with. 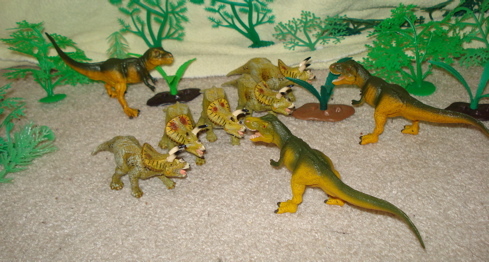 Torosaurs most likely lived in herds, constantly migrating as they sought fresh fodder. With their powerful beaks they could easily snip off tender branches and grind the vegetation into mush deep in their mouths. While no one is quite sure what purpose the frill and horns served; consideration runs from courtship display and dominance to self-defense. I, at least, presume that it doesn't really matter. 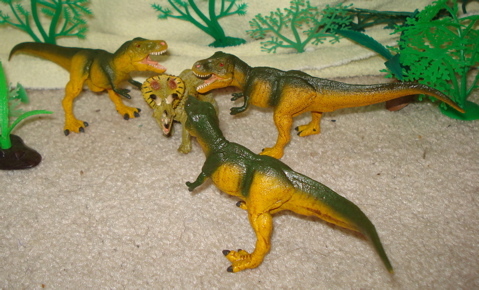 We are discussing Dinosaur toys here, not the Dinosaurs themselves after all. These can have great knock-down, drag-outs with their companion SUE Tyrannosaurs or any body else who happens along (below). "Who the heck are you guys?" 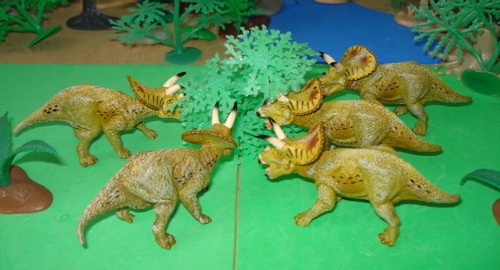 And of course feeding these Torosaurus is easier than keeping the originals satisfied. 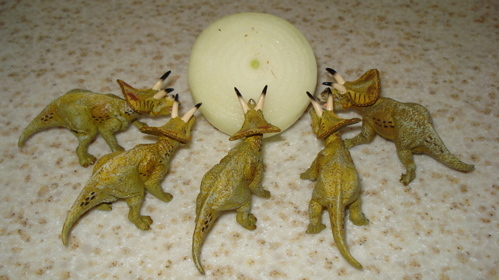 "Give our Torosaurus herd an onion and we can eat for a week." 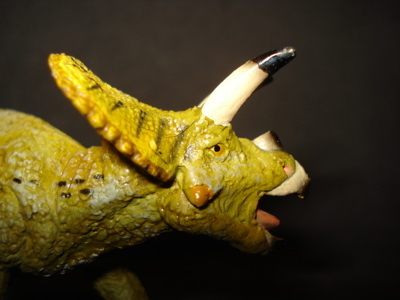 This Torosaurus is highly textured in a pattern reminiscent of scales right from the frill and throughout the body. The musculature of the body and legs are well defined with the rib-cage visible on the left side of the body and pachyderm-like skin-folds clearly seen in the neck and belly. Another great thing about these Torosaurus (as well as their companion SUEs and Anatotitan) is that they are made of a relatively soft rubber which can be readily (moderately) reconfigured. What this meant for me is that I was able to straighten the head out a bit, putting it more in line with the way I personally prefer Dinosaur toys to be. Below with MARX Triceratops. 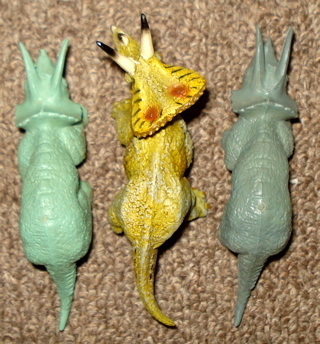 The "altered" Torosaurus is second from right. The alteration is quite slight. "Uh oh! Better line-up guys!" 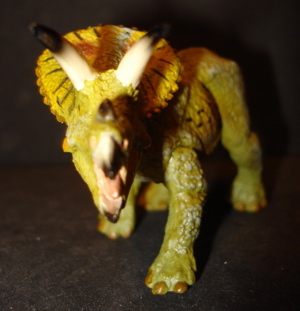 We do not know if real Torosaurus - Triceratops behaved in this way but it does make sense to imagine it so. These (Triceratops) were the most common large vegetarians of the late Cretaceous Period and it makes sense that such huge herd animals would have a common form of defense. The Safari Torosaurus looks quite well, bottoms-up, as the detail-work does continue across the belly and tail bottom, showing particularly in the throat. 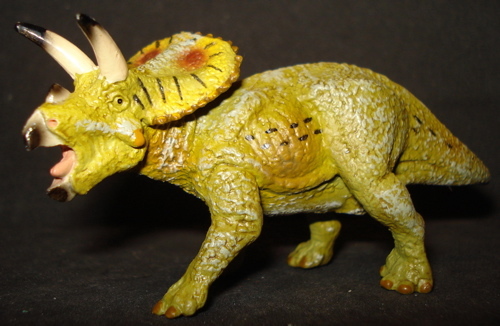 The imprint on the belly is "Field Museum Torosaurus c-2004 Safari Ltd Miami, FL Made in China CE". The "CE" is the European Union's imprimatur that indicates that the figure is essentially non-toxic. Apparently this makes them more attractive as dinner companions to, say SUE. Tyrannosaurs, particularly younger ones, may very well have hunted in packs and if so there is no reason not to believe that they became pretty darn good at it. After all, they had millions of years to perfect their style. 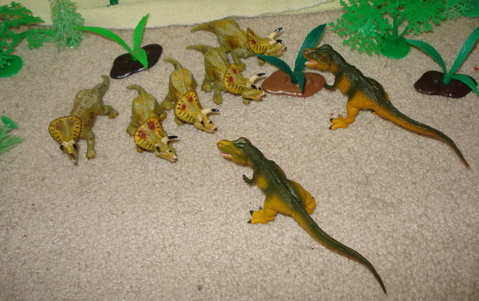 A third Tyrannosaurus Rex slips in behind the spiky wall the Torosaurs presented to the T-Rex pair and they panic, every Torosaurus for itself!! Things aren't looking good for that last Torosaurus. The Safari/Field Museum Torosaurus was introduced in 2004 and is currently (2010), permanently, out-of-production. It is still available, new, although I have not found it through a specific internet search (and have never seen them in a brick & mortar store) nor have I found them on eBay. 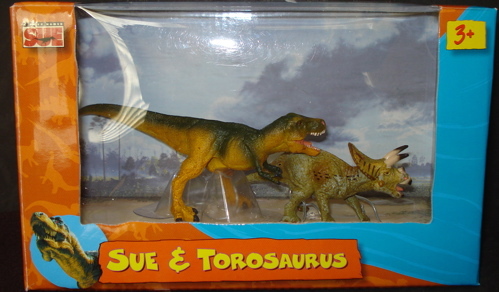 I have found it when searching for "Sue" and/or for the Anatotitan. I consider this to be well worth obtaining and it can be gotten for under $3.00. 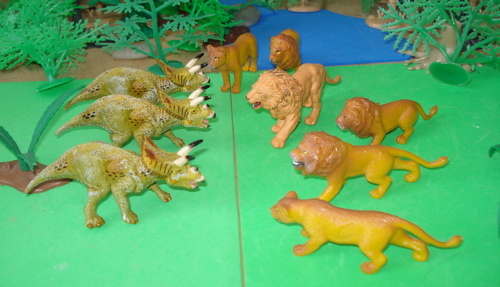 Just remember that it will, because of its smaller size, not really fit in with many contemporary (such as the 'museum quality' collections of Carnegie, Bullyland or Schleich to name a few) Dinosaur toys which are generally 1/30-40 in scale they will work and play well with the smaller figures and do fit right in with the vintage Marx and MPC Dinosaur toys. 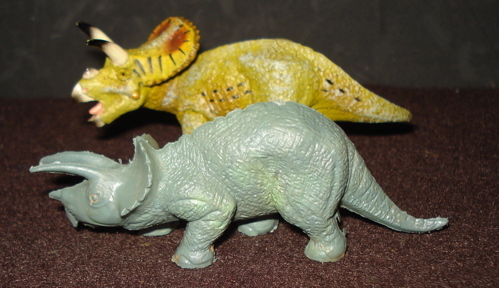 These Safari/Field Museum Torosaurus can be obtained in two ways. The first is individually, bagged and tagged (see above) for from under three dollars to, I suppose, whatever the traffic will bear. I got one of mine for $2.89. The others came in what is called a 'gift box' which I purchased for $3.50 which includes the 'open mouth' Sue figure as well. 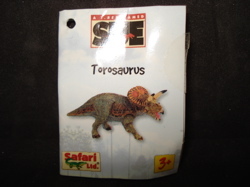 So in addition to the Torosaurus I got 'SUE-d' for 61c. A good deal. (Plus shipping.) I've found 'gift boxes' for as much as $13.00 too. But I considered them lost. The Torosaurus in the box does not come with a tag. It is doubtful that a tag will help our lone Torosaurus, separated from its herd and surrounded by Tyrannosaurs that do not appear interested in playing tag. It will have to rely on its wits. "Have y'all considered vegetarianism as an alternative lifestyle?" "Okay. I'm it. Now you three run off and I'll find you." "Sorry snacky, we're not falling for that trick, again. These are really great little figures. They have everything I personally value in Dinosaur toys. They don't do anything without the active intercession of my hand and my imagination. They are easily remolded to fit my ideal of how they should look. 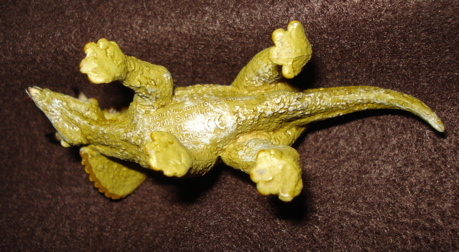 They are extremely well detailed and very nicely painted in natural-looking colors. There are no parts to break off or get lost. They are each individualized in appearance. 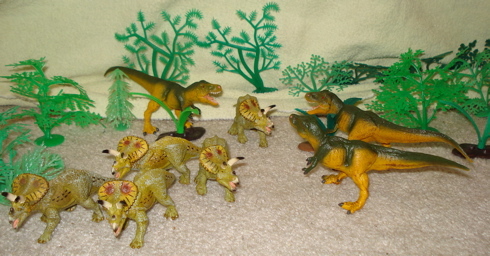 Dinosaur TOYS really don't get any better than these. That's a recommendation folks. They'll look great shown off on your shelf, playing on the floor and in the sand box or in a diorama. 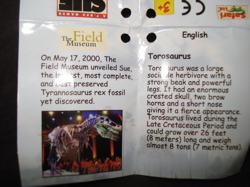 You have been reading our Safari/Field Museum 2004 Torosaurus page. 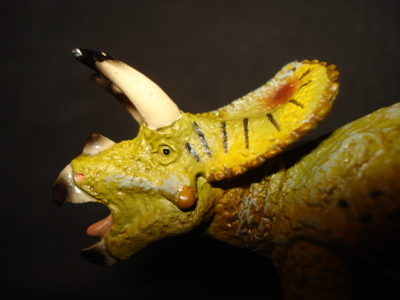 You can go to our main Ceratopsian page by clicking this link or to our Triceratops page by clicking this one.